This site, 3.5 miles N.W. is where Col. Jas. McIntosh, 2nd Ark. Mtd. Rifles, routed Loyal Union Indian forces, Dec. 26, 1861. The battle started with fire from the Indian line on Patriot's Hill, 2 Mi. S.W. The Loyal Indians finally fled into Kansas. 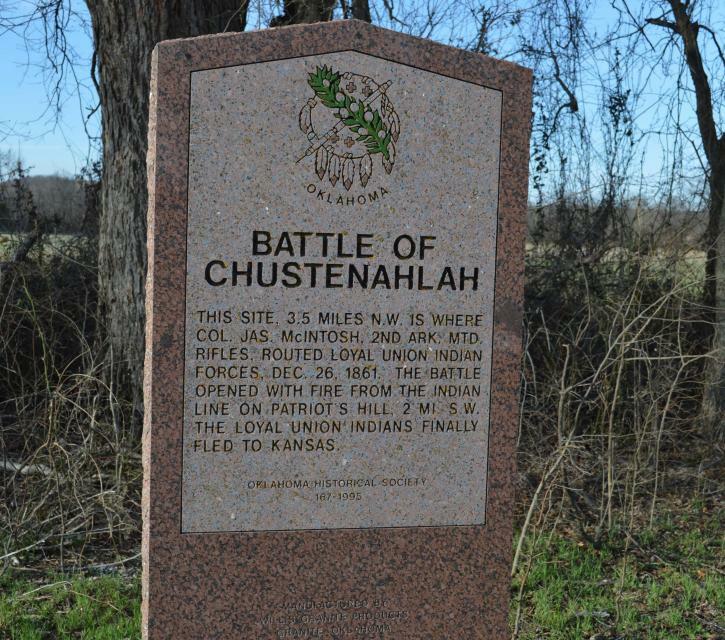 Battle of Chusto-Talasah or "Caving Banks"
I visited the marker early this week and it's in great shape. The turnout is also in good condition - easy to pull off and on the highway without any ruts or potholes in the dirt road. This marker can also be identified by its HM code. You can use the hashtag #HMZA2 in tweets, and any other place where you might refer to this marker, including when searching on this site.